It is a star based rating system. It is used to take user input as a rating. It is useful when we want to get user feedback. It is mostly used to get product rating. required false Boolean It makes the component as required. Validator null MethodExpr It is a method binding expression that refers to a method validating the input. valueChangeListener null MethodExpr A method binding expression that refers to a method for handling a value change event. stars 5 Integer It is used to display number of stars. disabled false Boolean It disables user interaction. readonly false Boolean It disables user interaction without disabled visuals. onRate null String Client side callback to execute when rate happens. cancel true Boolean It is used to cancel. 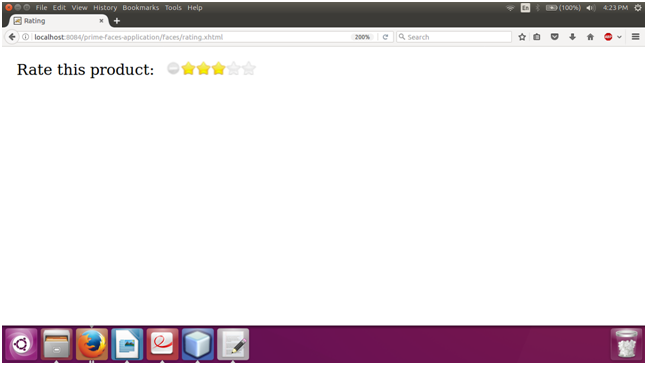 Here, in the following example, we are implementing <p:rating> component. This example contains the following files.